Previously, I knew Bedford Falls as the setting for the timeless Christmas classic It’s A Wonderful Life. Now, I know it’s also a real place—or at least based on one!—and it happens to be the home of some inspired Christmas candles. Wickedly Whimsical Candles is a one-woman-shop based out of Seneca Falls, New York, the inspiration for Bedford Falls. So when Katie Hockey set out to create a line of candles to celebrate the season, it’s no wonder that It’s A Wonderful Life factored heavily into her creativity. These Christmas candles are fantasy locales brought to life through scent. Hockey sent me two of her holiday line of candles. 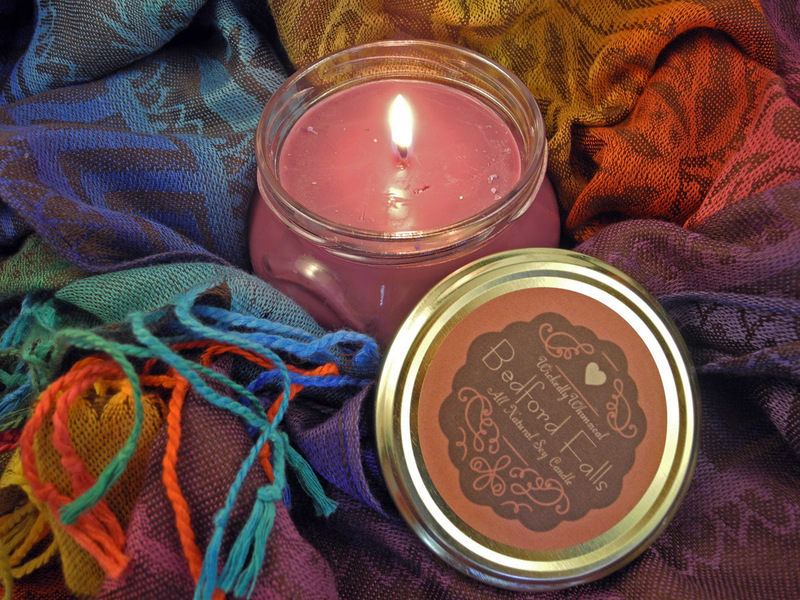 Bedford Falls is a deep purple candle that smells like woodsy pine blended with fruity cranberry and spicy cinnamon. 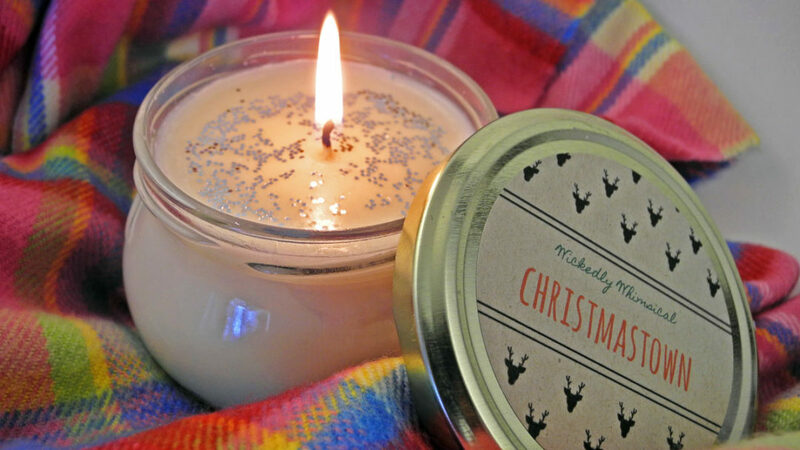 Christmastown, inspired by another seasonal staple, The Nightmare Before Christmas, is a white candle enhanced with silver glitter that smells like an enchanted forest of sweet cedar and fir. Many of the candles I use are quite fragrant—I can smell them across the room before I even light them—but smelly candles aren’t everyone’s cup of tea. Wickedly Whimsical Candles have a more moderate aroma: like the perfume of a rose, you’ll experience it in wafts instead of all at once. That makes it a great pick for people with scent sensitivity who might find the smell of a big box Bath & Body Works or Yankee Candle to be too overwhelming. All of Hockey’s candles are made out of 100% soy. My readers know I love soy candles because they’re clean-burning and natural, but as usual I want to remind you to never blow a soy candle out—extinguish it with a wick dipper to avoid smoke. Additionally, always keep the wick trimmed to a quarter of an inch to avoid fire hazards while extending the candle’s life at the same time. Interested in trying out your own? Just in time for this Christmas candle line, Wickedly Whimsical Candles has a coupon code for Candle Fandom readers: simply use the code SAVE4 to get $4 off a purchase of $20 or more when you shop here. Have you ever tried a Wickedly Whimsical Candle? Which candle brand do you think I should I review next?